The important role of ?nely dispersed matter and surfaces in medicine is not always fully understood and appreciated. Speci?cally, ?ne particles (solid or liquid) in the size range of several nanometers to several micrometers have a tremendous effect on our lives, because they can be bene?cial or detrimental to our well-being. Such particles are present in living bodies as red blood cells or cholesterol crystals in the gall bladder. They are ubiquitous in the environment, where they can cause many diseases, such as asbestosis, silicosis, and black lung disease, but they are also used in diagnostic tests, drug delivery, and numerous other applications. More recently, evidence has become available that drug formulations with active components in a ?nely dispersed state may signi?cantly affect their functionality. Furthermore, with miniaturization of medical instrumentation, the size of the components is necess- ily reduced to colloid or even smaller range. 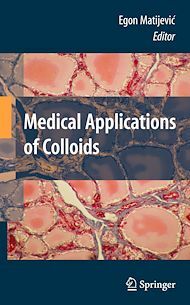 This volume is a collection of several chapters dealing with diverse topics of colloids and surfaces relevant to medical applications. Thus, Siiman describes the use of optical properties of uniform colloidal particles as probes in ?ow cytometry. Giesche focuses on the preparations and properties of exceedingly uniform silica spheres for different uses, such as in chromatography. In modi?ed forms, silica p- ticles with incorporated dyes are employed in diagnostics and those combined with tiny magnetic entities in drug delivery.